I've wired up my account at Multiply (a social network) to track posts here on my family tree blog, so that I don't have to find excuses to write more and more posts about myself and, admittedly, how cute I was as a kid. 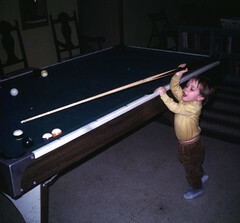 Here's a picture of me, playing my first interactive game. The controller was obviously sized for an adult, and I failed my saving throw vs. inhaling chalk dust, but otherwise, it was a great success.